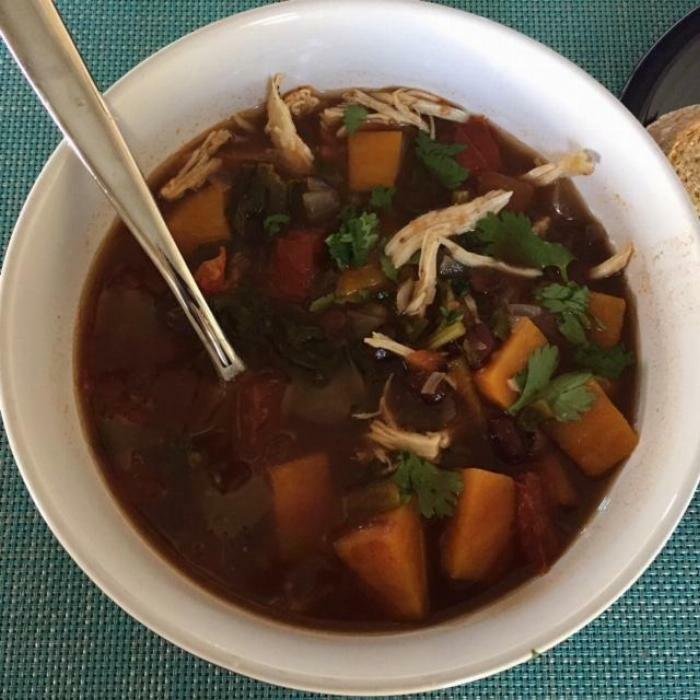 Embracing autumn in the Southwest, threw this soup together using chicken stock and leftover chicken from a homemade roasted chicken & local, organic veggies. 2Throw all ingredients (except cooked chicken) into slow-cooker on high high - 4 hours or low for 6-8. Add spices to taste. Ingredients are just a guide. Even though you are using fresh tomatoes, the adobo sauce and sweet potatoes have enough sugar to balance the acid of the other ingredients. 3Add lime juice and cooked chicken towards end to avoid overcooking. Optional: Serve with fresh chopped cilantro, diced avocado, and warm tortillas. Make it fast! Substitute homemade roasted chicken and chicken stock with store-bought rotisserie chicken & stock. Make it faster! Use rotisserie chicken leftovers & store bought stock. Use canned tomatoes instead of fresh. Make it Vegan! Omit chicken and use vegetable stock in place of chicken stock.